I have to say I had made macarons with the recipe from this book before and the macarons came out look like a meringue. I don’t know why and I don’t want to try again until now. I have a lot more confident to make these little French cookies. 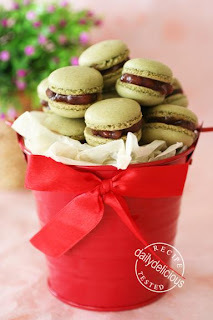 Now, I know that the real problem is not the book or the recipe but the technique, making Macarons is not hard but you have to know HOW. The recipe is from................ (I have all 3 of her books and ..............is the one which I wrote about last time). The recipe is from this book but the how-to is changing. I use the methods that give me the good result every times. I know that Macaron is French but it’s very popular in Japan and this is one of great combination. Green tea is good contrast to the sweet flavor of the red bean, and when come along with a cup of hot green tea, these little cookies will be the best way to brighten up the lazy afternoon. * Fresh egg white is not good for this kind of cookie. Sift icing sugar, almonds and green tea powder through a fine sieve, pushing mixture through with a wooden spoon; this will help to make a smooth macaron. * If using sliced almond: Place the almond, icing sugar and green tea powder in a food processor and process until the mixture fine as flour (about 3-5 minutes). When the almonds are ground, using a wooden spoon, press the mixture through a medium strainer. Using an electric mixer, whisk egg whites until foamy. Add caster sugar, a little at a time until using all, and whisk to firm soft peaks. Stir in almond mixture; in three or four additions. When all the dry ingredients are incorporated; the mixture will look like a cake batter. Spoon mixture into a piping bag fitted with a 5mm nozzle. Pipe or spoon mixture into 2.5cm rounds onto baking paper-lined (or Silpat) oven trays. When you’ve pipe out all the macarons lift each baking sheet with both hands and then bang it down on the counter (you need to get the air out of the batter). Set aside for 1 hour. After 1 hour the top of the macarons will be dry, and ready to bake. Preheat oven to 150°C. Bake for 16 minutes (baking time can be varied, from 10-15 up to your oven) or until firm to the touch. Remove from oven and cool on trays. Slide a knife under each macaroon to release from paper. Store in an airtight container for up to 1 week or until ready to assemble. oh i would like to ask you if you have any durian related recipes? or any dessert made with durian? dried unroasted angmoh almond or chinese almond>? The almond is plain almond not Chinese almond. I will try to find good recipe with durian for you. You noted that "Fresh egg white is not good for this kind of cookie. " Can I use normal eggs which I usually buy from grocery store and store in fridge? Your macaroons look so yummy. I can't wait to try it out! This recipe is the great way to use the egg white that left from the other recipe, you can use normal eggs which you buy from grocery store and store in fridge. The cracking problem can comes from the freshness of the egg white and the temperature of the oven. You have to separate the egg white from the yolk and keep it in the box , and refrigerate it for a week to liquidize it. And the temperature of the oven you may have to lower it about 10-20 degrees. Hope my suggestion can help ^ ^. Hi Pook, thanks will try it out. I tried this macaron sometime back. My first time ever. I was expecting the worst but surprise, surprise, feet started to form and I was the happiest. They didn't crack either. Only problem was the consistency was too fluid is was hard to pipe them in perfect rounds. Is it suppose to be like that? It's not a problem if the batter is too fluid, because the French macaron will be left to dry before baking. I'm so happy that you can make it. help! my mac doesn't have feet and dry. why is it like that? It can be the problem from resting time, you have to let them dry before baking, and you might reduce the temperature a bit. Ps, sorry for answering you so late. Please help! I follow all the steps you mentioned and my mac did not form any 'feet'. I waited for an hour before putting them in the 150C oven. What else can go wrong? Your macaron must be dry (when you touch the top of it, the top is hard and nothing stick to your finger), and did your macaron crack or the no feet is the only problem. You baked perfect macarons. WHy my macs feet are shrink once I took them out from the oven??? Do you use top or bottom heat when baking? Do I need to turn on the fan? Thanks in advance for your advice. Your photos are always nice. I realized that this recipe is more liquid compare to your other macaron recipe. Does the more liquid makes the macaron more smooth ? 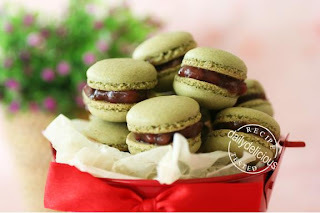 I have try your strawberry macaron as my basic macaron n it turn out very well. The feet of the macaron will shrink a bit after it reach it maximum hight in the oven. I use only bottom heat and if you can using fan is great for the macaron too. I use the strawberry macaron as my basic macaron too, I think a lot of liquid makes the folding process harder, but not smoother (the smoothness depends on the almond). I made macaons with red bean fillings, but noticed that red bean pastes will always soften the shells..
Did I make it wrong or? No, it's not wrong, it depends on how moist your paste is, you can cook the paste longer to remove the water.